I am a TRS and I do not have a store. 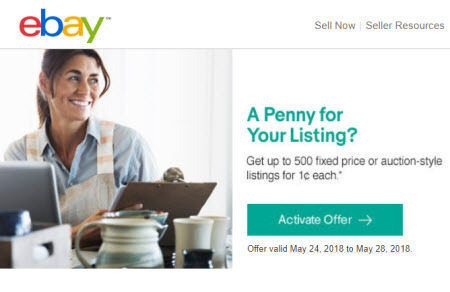 Before listing any new items the morning of 5’24, I checked to see if there were any listing promos as I exhausted my 50 “free” listings several days ago and have been paying .35 cents to list some Memorial Day items. No promo listings were in my “Promotional Offers” area. I went on to list five items. A bit later on 5’24, I see that a “Promotional Offer” has been posted. I can list 100 items at .05 cents. The problem with the Promotional Offers that I receive from eBay is this, eBay did not send me an official message until 5’25 about the promotion that started on 5/24. Why is the message a day late? This has been the case with almost every promotion I have gotten from eBay. And yes, this was specifically directed to me because of my “non-store” status. Heading on the eBay message to me “Get More Offers Like These. Open an eBay Store”. I know it sounds wimpy, but I am afraid to open an eBay store! It would save me in fees, but I am still using the old way of listing, not the Seller Hub and I know that major screw ups will happen if I switch. Heck, they can’t even send me a message on time about a promotional offer! But at least I am only paying .05 cents now instead of .35 cents until 5’28 on items that no one is seeing! (the amount of “looks” on my items is dismal, definitely being blacked out!). All looks on eBay are dismal because they have turned off all of the buyers that we used to get. They do not want to deal with the garbage that eBay is thrusting on them.